The Evos concept car by Ford is on display at the international car show IAA (Internationale Automobil-Ausstellung) in Frankfurt. Following smartphones and tablet computers, motorists look set to be the next big market for connected devices as automakers wow crowds with the latest Internet-enabled models at the IAA motor show. Following smartphones and tablet computers, motorists look set to be the next big market for connected devices as automakers wow crowds with the latest Internet-enabled models at the IAA motor show. The times are long past when car shows reeked of motor oil and fans were obsessed with engine power and sleek designs. With the aid of cloud computing, automobile makers believe the car of the future will no longer be just a vehicle, but an extension of the home or workplace, where drivers will have access to emails and keep up-to-date on their social networks even on the road. German top-of-the-range manufacturer BMW already offers an onboard computer with Internet access whereby drivers can locate a restaurant of their preference, the nearest ATM or free parking space in a matter of clicks. And rival Daimler is not to be outdone, either: its new in-built computer allows drivers to surf the web as long as the vehicle is parked. 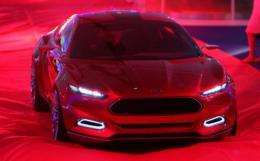 In its new concept car on show unveiled at the IAA this week, the Evos, Ford claims it can fine-tune the car to personal preferences, even down to the cabin temperature, and access to the driver's home entertainment systems for listening to favourite news and music programmes. 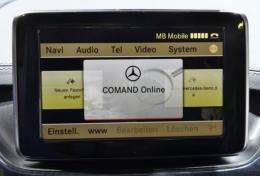 The onboard computer of a Mercedes-Benz B-class displays the name "Comand online", which is the name for Mercedes-Benz's internet connection system for onboard computers, at the international motor show IAA in Frankfurt. Following smartphones and tablet computers, motorists look set to be the next big market for connected devices as automakers wow crowds with the latest Internet-enabled models. "A successful car must offer lifestyle, comfort and also fit in with people's ecological awareness," said Stephan Reith of the consultancy firm, Booz & Company. Studies suggest that the number of Internet-enabled vehicles worldwide will soar in the coming years. According to BITKOM, the German industry association for IT, telecoms and new media, one out of every two drivers in Germany would already like Internet access in the car. "And if the market says: 'That's what we want', that's what it gets," predicted LBBW analyst Frank Biller. "Connectivity is a megatrend," the analyst said. Navigation systems have long become more than just fancy accessories. And automotive part makers such as Bosch in Germany and Valeo in France are busily investing in state-of-the-art onboard computer technologies, with the French group, for example, unveiling a new system which parks a vehicle without the driver in the car. Nevertheless, the new services are not without their dangers, such as driver distraction. The challenge is "to meet customer demands without impinging on traffic safety," said BITKOM board member Martina Koederitz. And there are other security concerns, too. US anti-virus software group McAfee warned of possible hacker attacks on vehicle computer systems. "It's one thing to hack into someone's email account or laptop. But if cars are hacked, that could seriously compromise critical safety systems," said McAfee general manager Stuart McClure. And data protection specialists warned drivers must be careful about the sheer volume of personal data stored, particularly in electric cars, which could be used to track somebody's whereabouts or movements. Using your car key as a credit card? "... as long as the vehicle is parked."